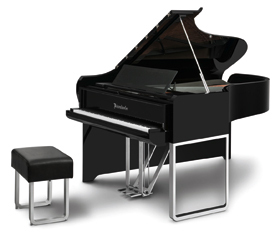 Audi Design Grand Piano, Acoustic Piano from Bösendorfer. To create the design, the Audi Design Studio team in Munich set out to house a concert grand piano in an Audi “outer skin,” reinterpreting Audi’s design philosophy in the form of a grand piano, the companies say. The Audi Design grand piano incorporates aspects of Audi automobile design: "the piano features generous surface areas, sleek lines, sharply drawn edges and logically positioned joints," they say. The lid extends without a break down to the base – an innovation designed to yield a large, one-piece surface. To reduce the sense of weight on the treble side, a slim aluminium-look leg is used. The designers have concealed the hinges in the lid above the keyboard. The lid itself can be opened with an integrated handle. 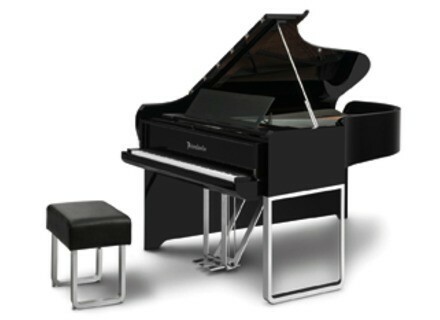 Priced at $140,000, the instrument can be ordered at audi@Bösendorfer.com. [Musikmesse] Steingraeber & Söhne D-232 New Semiconcert Grand from Steingraeber & Söhne.